Make Gigabit Ethernet connections with PoE support. 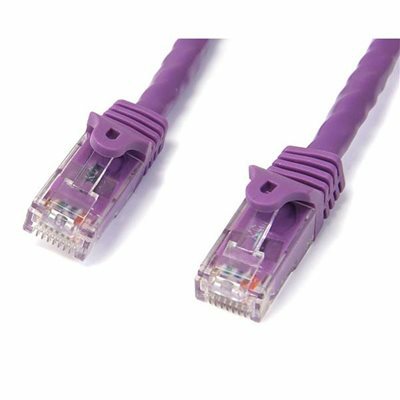 This Cat6 cable delivers reliable Gigabit network connections, which ensures high-performance capability for your demanding Ethernet applications.This 6-foot purple patch cable is perfect for standard applications such as connecting from a wall jack to your laptop docking station or desktop computer.For easier network installations, the Cat6 patch cables are available in a wide variety of lengths and colors. This ensures you have the right size of cable available when you need it and it lets you color code your connections for a more organized setup.For trouble-free cable runs, this durable cable features snagless connectors that protect the RJ45 clips during installation, making them less likely to snag or break.The cable also features molded boots which offer connector strain relief by stopping the RJ45 connector termination points from bending at sharp angles. This reduces the risk of damage to the cable, which could decrease network connectivity and performance.Get the highest value for your cable investment with the Cat6 Ethernet cables. Each of the patch cables is manufactured using high-quality copper conductors and they are carefully constructed and tested, to keep Near-End Crosstalk (NEXT) well within acceptable limits.Ensure high-performance capability for your demanding Ethernet applications, such as Power-over-Ethernet and 4K or 1080p video streaming, using cables that include 24 AWG copper.You can rely on the RJ45 connectors to deliver optimum conductivity while eliminating signal loss due to oxidation or corrosion.